How does Renee Gladman manage to make language different from itself? How does she make space different from itself too? In this short novel there is an expansive mystery, but I don’t think it exists to be solved. There is “Bze,” but there is also fried fish. There is a city with structures in it that multiply or are “half-articulated,” where climate dictates how the city’s inhabitants move. Morelia is exquisite. And Gladman is, easily, one of the most intriguing and important writers of our time. I read this book as a gift to fiction writers. It maps my reality as a person whose daily experience is made simultaneously by the immediately sensory, the aftermath of dream, and the constant sense of narrative at work. 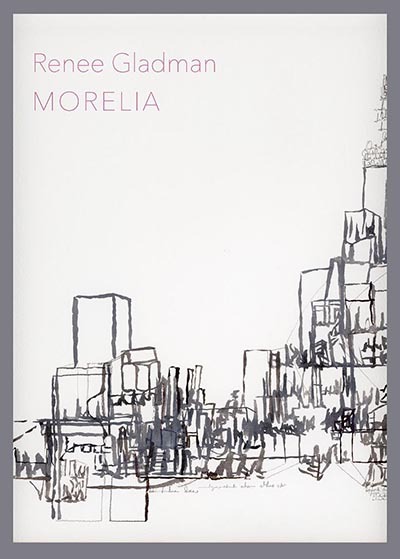 Morelia is an immaculately constructed, entirely fictive landscape, a story of the adventure of detection in its every aspect. No one writes prose like Renee Gladman. Strange and brilliant, a mystery, an adventure, a mad escape: this story is all Gladman, shimmers with Gladman, sings. Every page is a song.